1. Place sugar into a small pot with tall sides and shake the pot to make sure the sugar has a flat and even surface. Attach a candy thermometer to the side of the pot, making sure the tip isn’t touching the bottom of the pot. 2. Top sugar with cut butter and corn syrup and place over medium heat. Cook mixture until sugar melts completely and mixture begins to caramelize. 3. Gently stir with a wooden spoon to incorporate the melting butter into the melted sugar. Continue to cook the sugar and butter until an amber color develops and the candy thermometer reaches 310˚F. 4. Quickly remove the mixture from the heat and stir in cashews. 5. Pour mixture onto a silpat (or foil) lined baking sheet (with raised edges), moving the baking sheet around on a slit tilt to create an even 1/4 inch layer. 6. Allow the brittle to set for about 5 minutes, then sprinkle the surface with the sea salt. 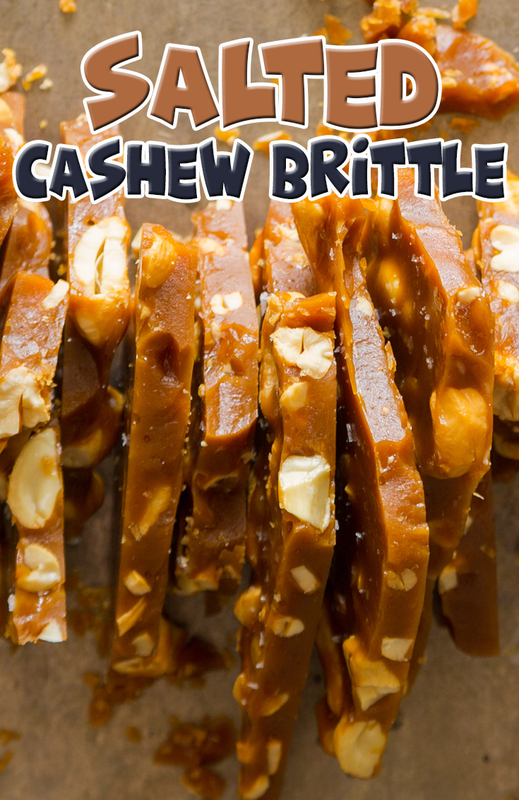 Set aside until the brittle has completely hardened (about 20 to 30 minutes). 7. Using the bottom of a knife handle, crack the brittle in multiple areas until you have sizeable serving pieces. Store in an airtight container until ready to serve. **If using water instead of corn syrup: Once you’ve shaken the pot of sugar, so the sugar has a flat and even surface, slowly pour the water around the perimeter of the pot so the edges of the sugar get wet….this will help to prevent the sugar from crystalizing.